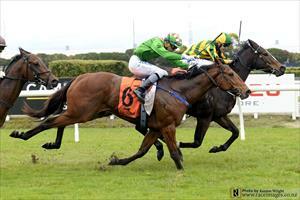 2.42 p.m. R5 5 Tiny Terror (3 g Shamexpress – Thora, by Pins) – Jake Bayliss; won a trial by nine lengths off the front in July at Te Rapa, before copping interference and being promoted to first when debuting on the same course in the 3YO 1100 metres on 4 August. Drawn barrier eight in the $50,000 El Roca – Sir Colin Meads Trophy (Listed, 1200m), he has the gate speed to position prominently and the strength to prove competitive. Fixed odds: $9.50 & $2.60.